McDonald's will be promoting their new Real Fruit Smoothies with free samples today and tomorrow (Friday & Saturday July 23-24). 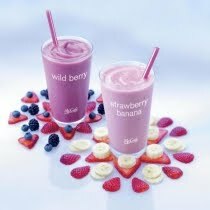 Free samples of Wild Berry or Strawberry Banana Real Fruit Smoothies will be available at McDonald's 14,000+ locations in the US. “The addition of McCafe Real Fruit Smoothies to the McCafe beverage line reinforces McDonald’s as a convenient destination for a variety of quality, great-tasting beverages at a value only McDonald’s can offer,” said Ashlee Yingling, supervisor of U.S. media relations for McDonald’s. Prices for the smoothies vary by market and start at a suggested $2.29 for a 12-ounce serving.